Situated in a magnificent 105 acre estate located in the western part of the Loire Valley. 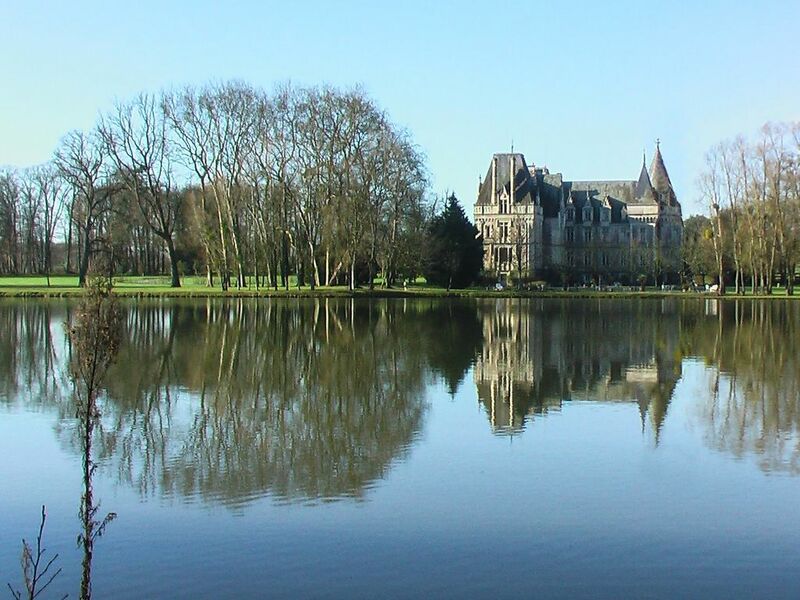 this castle is surely one of the most spectacular chateau rentals in France, offering a 22-acre private lake, lovely island, wonderful lakeside terrace, swimming pool, tennis, palatial lawns, gorgeous gardens and forests full of wildlife. With an elevator servicing all four floors, access to the reception rooms, dining rooms, chapel and the gorgeous en suite bedrooms available for Guests is easy. Internet & wi-fi are included, and housekeeping services can be arranged. Self-cater or we will prearrange delicious catering including breakfast, lunch, and dinner served in the dining rooms, gardens or on the lakeside terrace as you prefer. There are lovely walks amongst the gardens, around the lake’s 2.5 kilometer shoreline, and through the woods. The swimming pool and adjacent pool house offer delightful relaxation in or out of the sun. You can play some tennis or go boating on our lake. (There's excellent carp fishing.) Wine tasting, golf, horseback riding, bicycling, river boat tours, hot air ballooning, museums, churches, restaurants, gourmet cooking classes and shopping are all nearby. The Chateau is well situated just 20 minutes from Angers with its great shops and restaurants. Angers is 85 minutes from Paris via TGV, and the international airport in Nantes is about an hour away. There are many other delightful villages to visit nearby. Enquiries from location agencies, location scouts and location managers are welcome as the Chateau is also available as a castle location rental for film, movie & television productions, TV series, commercials, and fashion shoots, etc., in the Loire Valley, France. Please note that the Château is not a B&B (chambre d’hote) and we do not rent individual bedrooms. Instead, the Château is a private vacation (holiday) rental that is only rented on an exclusive basis to one tenant at a time. The Chateau has been extensively renovated and sumptuously decorated with beautiful antiques and rich fabrics. Although majestic with its dramatic, double carved-stone stairway in the entrance hall, and elaborate 16.5 foot ceilings throughout the main floor, the Chateau is warm and welcoming. The Drawing Room is inviting with its oak paneling, huge log fireplace, and private lit terrace for early evening drinks and late night parties. The magnificent Grand Salon, with its parquet flooring, original oak linen paneling, tall windows, and massive mirrored fireplace mantle, offers a luxurious yet relaxed venue for gatherings both large and small. The Chapel, with its spectacular stone rib-vault ceiling, glorious stained-glass window, and gilded oak paneling is a consecrated haven for solitude and prayer. The splendid Silver Dining Room floor was specifically designed for hosting parties, including elevator access for guests and hi-speed dumbwaiters connecting the Silver Dining Room’s service kitchen to the main kitchen two floors below. Aside from the Silver Dining Room, there are numerous other places to dine in the Chateau, ranging from elegant to cozy. The Grand Salon room is fabulous, and the Courtyard and Lakeside Terrace both offer special outdoor dining experiences. There is even the lovely Salle du Jardin that's ideal for breakfast or when you’re in the mood for something less formal. There are also two apartments with 5 more bedrooms in a separate building that will accommodate up to 10 more people and are a 3-minute walk through the gardens from the Chateau. They are not decorated to the same standard as the Chateau, but they offer a very affordable way to have more people sleep on the estate at only €100 per night per apartment (€120 per night per apartment in 2020). The 2-bdrm will sleep 4 people; the 3-bdrm will sleep 6 people. There are also charming bed & breakfasts and hotels for many more Guests nearby. If you use the Instant Booking feature please do not leave a gap of less than 3 days between your booking and the preceding or subsequent booking.. (Creating a gap of less than 3 days may require adjustment or cancellation of your booking, particularly if it is between 1 May and 30 September.) Please also be aware that weddings (and some other large events) are subject to a supplemental fee that is not included in the normal rental rates. We suggest that you contact us (the Proprietor) prior to booking if you are planning a wedding or other large event. Many thanks and best wishes! All the bedrooms have en suite full bathrooms or shower rooms. There are 4 additional half-baths in the Chateau. Fresh linens provided on arrival, and weekly thereafter, free of charge. . Additional linen changes available for an extra charge. Large car parks on the estate. Fresh towels (excluding pool towels) provided on arrival, and midweek on 1 week booking, free of charge. Additional towel changes available for an extra charge. We have 3 dining rooms; Chatelain's Private Dining Room, Silver Dining Room & Country Dining Room, and a Kitchen Dining Area. Large private pool, complete with poolhouse. There are also two nicely decorated apartments with 5 more bedrooms in the Chateau’s adjacent Manoir which will accommodate 10 more Guests for an additional rental fee of €100 per night per apartment, with charming bed & breakfasts and hotels for many more Guests nearby. We spent a wonderful few days in this beautiful place. Susy and William, the owners, were extremely welcoming. They were discreet but always available should the need arise. Nothing was too much trouble. The bedrooms have a real wow factor each with their own unique colour scheme together with lovely views over the surrounding countryside and gardens. The gardens and lawns are extremely well maintained and cared for. It was delightful strolling around the lake in the autumn sunshine followed by tea or drinks in the lovely lakeside setting. It really was like living in a castle and dining on a film set. This is a great place for a special family gathering be it a small intimate group or a large occasion such as a wedding. Thank you Susy and William for sharing your home with us. This is the most beautiful castle in our journey! We had our wedding in this place, met the great people there as well! The lake is awesome, I love to sit by the lake with sunshine, it is really enjoyable. We want to say THANK YOU to Susy and William again! Thank you for your help and support, those memories will always in our mind. Wish you all the best! Amazing and unfordable experience ! Our group of 27 enjoyed a wonderful week at the Chateau. The owners and their staff were very accommodating . Each morning the air was filled with the baking of fresh bread and rolls. Suzy and William keep a very clean facility. Our group enjoyed four fantastic dinner meals that were over the top good. All our group were not ready to leave at the end of the week. We definitely desire to return for a future week someday. We rented the chateau for our wedding and it was an unforgettable experience. It felt like we had fallen into a fairy tale. We were nervous about organising a wedding abroad, but Susy and her team were so helpful. She always got back to us quickly and was able to recommend suppliers, with nothing being too much trouble. We stayed there with our guests for a long weekend and rented the manior accommodation as well as the chateau. The decorative style of the manoir was slightly different from that of the chateau bedrooms but very charming, with vintage French furnishings. We loved that all the chateau rooms had their own individual character and the tower room is amazing. We will never forget waking up in the tower room to the sun rising over the lake, turing it a vibrant pink. The grand stairway is stunning and we have some wonderful photographs of us standing on them with our guests, after our masked banquet. All our guests commented on the beauty of the accommodation and the extensive grounds. There is plenty to see and do in the local area, but most of us preferred walking around the lake, enjoying the stunning surroundings. You feel like you are in the middle of the countryside but there are supermarkets, restaurants and attractions within a short drive. Our guests either rented cars or brought their own, and there was plenty of onsite parking. Susy was really welcoming on our arrival and immediately made us feel at home. I cannot praise the staff enough, especially for the service during our wedding meal. The silver reception room is beautiful, like being in a period drama. We had two catered meals while we were at the venue and they were delicious. We had several vegan guests and they all said it was the best vegan food they had ever had at a wedding. The service wear is perfectly in keeping with the opulent surroundings. We were married in the chateau chapel and our photographer said it was one of the most beautiful venues she had photographed. We had a small and intimate wedding so there was plenty of space but you can also choose to be married in he grounds if you have more guests. Some of my favourite wedding photos are of the two of us on the island and crossing the little bridge to it, with the chateau in the background. We could not have asked for a more stress free and magical experience. Thank you so much Susy for all you have done for us. We have even had guests asking when we can go back and do it all again! The chateau is close to Angers a vibrant University town with great shopping including Galleries Lafayette and lots of restaurants and activities. lt is also close to Le Lion d'Angers - about 15 mins away with shops, a good supermarket and is well known for its equestrian facilities, horse-racing and other horse shows, particularly the Mondial du Lion d'Angers world renown event in October. There a several other villages with good hairdressers, bakeries, internet cafes etc. There is a fabulous Relais Chateau approx. 20 mins from the Chateau that provides wonderful food overlooking the Loire itself. Closer by a well known brasserie that serves food which is both delicious and original. The charming old village of Grez Neuville is only 6 miles away and has a delightful Creperie on the river. There are boats to hire and barges to ride that serve lunch or dinner. 50 minutes away is Le Mans, world renowned for its Formula One racing, particularly Le Mans 24 hour race, in June. The Loire Valley housed the aristocracy in their private chateaux during the summer in days gone by. Many now are museums. This is one of the rare chateaux which can be rented to vacationers and might well be the most up-to-date and sumptuous available to private families and small groups.